The success of an outsourced service desk initiative really comes down to one thing: the satisfaction of your users. As you seek a provider, keep that in mind. Any cost savings or operational efficiencies you generate can quickly be negated if your organization can’t get its technology issues resolved quickly and painlessly. It’s also important to keep in mind the distinction between a service desk and a help desk. Help desks aid end-users in fixing common technology problems. Service desks aid organizations in ensuring their users can use technology in pursuit of business goals with maximum effectiveness, including set processes and best practices. 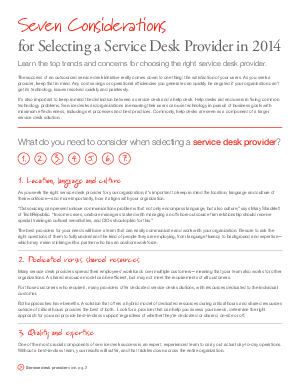 Commonly, help desks are seen as a component of a larger service desk solution.